Graduate Aptitude Test in Engineering (GATE) is national level examination for engineering graduates. The main objective of GATE is to test a candidate’s knowledge in different undergraduate subjects of Engineering/ Technology/ Architecture and post-graduate level subjects in Science. The level of knowledge of any particular candidate reflects in his GATE score. The GATE score is considered by IITs and NITs for inviting engineering graduates to pursue post-graduate programs such as M.E., M.Tech., or Ph.D. The GATE score is also considered by Public Sector Undertaking companies (PSUs) like BHEL, Coal India Limited, GAIL, Indian Oil, NTPC, etc. for job screening purposes. Every year, millions of engineering graduates write the GATE exam, and the number is rising year-on-year, making the competition more and more intense. To crack GATE, an aspirant needs to be consistent with his preparation with a time-bound strategy to cover the entire GATE syllabus in mind. The best time to start preparing for GATE 2020 is now as you have almost a year to plan and execute your preparation strategy. If you are one among the millions of engineering students aspiring for GATE 2020, and planning to take the help of subject experts while preparing for GATE 2020 then you should join any of the best GATE coaching institutes. It’s appropriate now to enroll in any of the institutes as almost all of them are going to start their one-year regular classroom programs for GATE 2020 preparation. However, to enroll in any of the GATE 2020 coaching institutes can be challenging for some of the GATE 2020 aspiring students due to financial constraints. 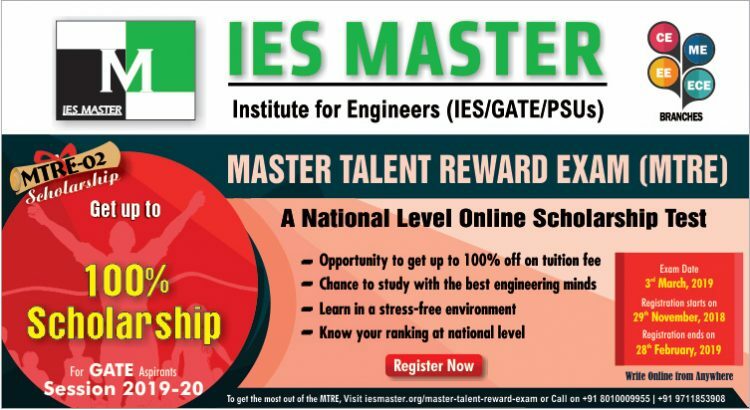 To facilitate the dreams of cracking GATE 2020 with good GATE score come true, and that too without digging a hole in parent’s pocket, IES Master – an institute for engineers – has come up with Master Talent Reward Exam (MTRE). MTRE is a national level scholarship exam that is conducted by IES Master twice every year. Currently registrations for MTRE-2 are open. Engineering students, who are aspiring for GATE 2020, and want to give a boost to their preparation for GATE can write MTRE-2 to earn a discount of up to 100% in tuition fee at IES Master. 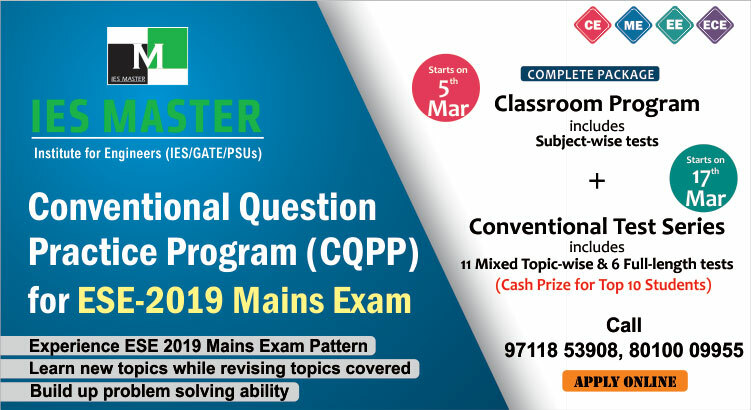 In addition to getting an opportunity to win a discount of up to 100%, by writing MTRE-2, GATE 2020 aspirants will also get an insight into the GATE exam pattern as the questions asked in MTRE-02 match the orientation and level of the real GATE. Writing MTRE-2 will also train GATE 2020 targeting engineering students in writing the actual GATE as this national level scholarship exam will be conducted in GATE like environment. MTRE-2 will also facilitate GATE aspirants in developing hand-eye coordination and other required skills that go into GATE exam. As MTRE-2 is a national level scholarship exam for GATE 2020, by writing MTRE-2 students can also analyse their performance and ranking at national level before going to write the real GATE 2020. MTRE-2 is scheduled to be conducted by IES Master across India on 03 March, 2019. So, if you are a GATE 2020 aspiring engineering student, and interested in writing MTRE-2 then register today for MTRE-2. Registration for MTRE-2 closes on 28 February, 2019.